Here’s a short guide on how to submit your website to the Ask search engine, although it’s not as popular as google or yahoo is does have a considerable user base and so you should submit your website or miss out on this extra traffic. 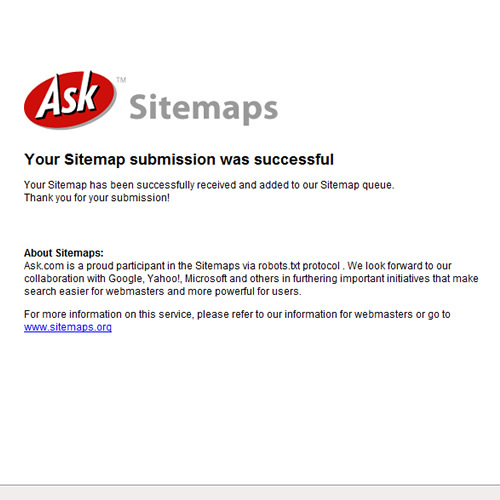 1) The first thing you need to do is create an xml sitemap for you website, instructions can be found here. 2) Enter the submission code below into your web browser, changing to match your domain name details and sitemap location. If you would like to submit to a whole bunch of search engines at once try the www.Free-Web-Submission.com service. d to rename it or create another file. Really brilliant peice of information on a great site. Already try it and successful. Nice share, very useful for me, many thanks. A reputable and well put together piece of writing that will serve to support searchers to appreciate a little more about this issue. I notice that you seem to be fairly high in status within the search engines like google and for that I appluad you – it’s not easy these days aiming to rank internet pages or even indeed internet websites. Your website is worthy nevertheless and I can understand the reason why you’re ranked in such a elevated placement for your keyword phrases through this internet page. I just submitted my new site with the information you provided. Thanks a lot. Nice I’ve given it a try. How do i make sure that it is indeed added and can be searched? I’m beginning to like Free-Web-Submission. Great job.